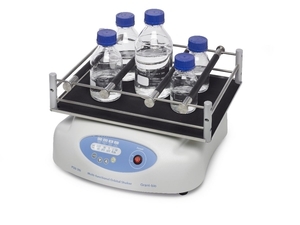 ... ideally suited to keep your cells alive and flourishing within your working environment with Thermo Scientific™ CO2 Resistant Shakers. Lubrication-free motor with silecer, speed control valve, quick coupling for 3/8" air hose and mounting adapter for Ecco pressure feed tanks (Ecco Pot) with a manual stirrer. For use with pressure feed tanks B.D.M. there is a special adapter. Models F20 and F40 are entirely made of sheet metal coated with acid-resistant epoxy powder, model F30 is made of painted cast aluminium alloy. An agitator mixes liquids to ensure homogeneity. It also speeds chemical reactions among the mixture's constituents. These devices are found in laboratories and industrial settings, including biological, chemical and petrochemical facilities, in metallurgy, pharmaceuticals, agribusiness, water treatment plants, paper and perfume manufacturing. They mix paints and varnishes, fruit juice, wine and milk products, among others. In magnetic laboratory models, the container holding the liquid sits on a plate. A rotating magnetic field beneath it spins a small bar magnet placed in the liquid. The plate also may be a heating element. Other types include shakers, vibrators and mechanical agitators with a plunger. Industrial versions are mechanical, driven by an electric motor with electronic variable speed control. They include impeller, propeller, anchor or butterfly models. Some are double-action, with an element that scrapes the sides of the vessel. Magnetic drive ensures that the container remains watertight. These machines have a horizontal or vertical axis and create radial or axial motion in the liquid. Choice will depend on speed range (in rpm), the type of motion imparted and the operational conditions (pressure, liquid viscosity, corrosion factors).